In a workshop I recently gave in Atlantic City, I distributed the following list of possible linguistics-based projects for the foreign language classroom. They are adaptable for a variety of languages and levels of instruction. To download a PDF version, click here. This list is a subset of the projects included in the companion website for my book, ¿Por qué? 101 Questions about Spanish. Here I divided them into the four categories of “Language history,” “The target language in the world,” “Language learning,” and “Language use”. If you make use of this list, as an instructor or a student, please write back and let me know how the project(s) turned out. Examine a few pages written in an older form of the target language. What are obvious ways that the language has changed? Look up the origins of the words in either (i) a sample of text from the target language, or (ii) a specific vocabulary domain, such as clothing or animals. Where do the words come from, and what does this teach about the history of your language? Research and create an infographic about a phase in the history of your language, such as the Golden Age of Spain or the Napoleonic period in France. What were the linguistic landmarks of these periods? Research vocabulary borrowings into English from the target language. What do they tell you about how the two cultures have interacted? Research the etymology of a dozen place names (names of cities, towns, etc.) in a country that speaks your target language. What does it this exercise teach you about the language’s history? Summarize your findings on a map or other infographic. Use Ethnologue (an on-line database about world languages) to gather data on where the target language is spoken and what other languages are spoken in those countries. Present as an infographic or a slideshow. Profile a language academy such as the Académie française or the United States branch of the Real Academia Española. Who are the members? What are their activities and/or publications? What would you ask if you could interview them? Research and present information about a language controversy, such as Catalan versus Castilian in Catalonia, or the historical tussle between French and Alsatian in Alsace. What information does the most recent USA census provide about speakers of your target language in our country? Try to predict which features of English are most hardest to learn for speakers of other languages. Interview an ESL teacher to test your predictions. Try a few lessons in the target language from Duolingo, Rosetta Stone, or other language learning software. How does the software try to teach the language? How is this different from classroom learning? How might you reform the spelling of your target language to make it easier? Argue for your changes and transform a sample page using your proposed changes. Pick your favorite language rule: ser vs. estar, passé composé vs. imparfait, and so on. Analyze actual text (perhaps a newspaper article) to see if the rules taught in class explain the actual usage. Learn how to speak “Pig Latin” in the target language (e.g. Spanish jerigonza). A speed contest may be in order! What do you have to think about as you speak in order to accomplish this? Find, watch, and compare instructional videos on some difficult aspect of pronouncing your language (like rolling your r’s). Make your own instructional video. This entry was posted in Learning Spanish, teaching Spanish, ¿Por qué? 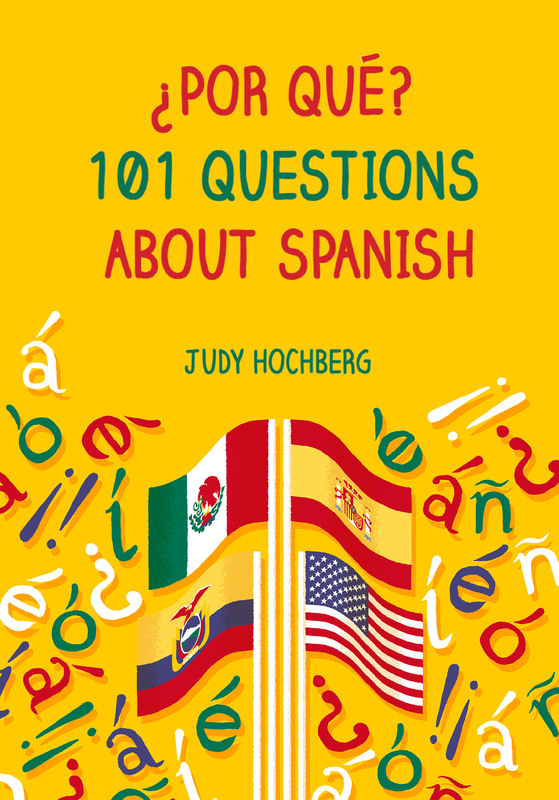 101 Questions about Spanish and tagged etymology, language academy, language history, linguistics, projects, Spanish on 25 November, 2017 by jhochberg. Can one be obsessed with a verb tense? My particular flame is the imperfect subjunctive. I’ve already written eleven blog posts that at least mention it, mostly because of its grammatical interest. But the imperfect subjunctive can also be poetic. I practically started jumping up and down when I read the following passage, full of regrets, toward the end of Sofía Segovia’s Huracán. I’ve colored the imperfect subjunctives in red. Si no le hubiera disparado, si no lo hubiera conocido, si sólo lo hubiera herido, si no hubiera cargado la 30-30, si pudiera seguir con mis amigos. Si hubiera, si pudiera, si tuviera, si hubiera. Si hubiera. ‘If I hadn’t shot him, if I hadn’t met him, if I had only wounded him, if I hadn’t loaded the 30-30, if I could continue with my friends. If I had, if I could, If I kept, if I had. If I had. Isn’t that a beautiful bit of Spanish? Doesn’t it crush the English version? Doesn’t it sing? This is definitely one to clip out and keep to impress your friends. By the way, the beginning of this paragraph is clearly in the third person singular, as seen by the verb forms pudo, negó, and reclamó (see screen clip below). So another great aspect of the writing here is the jarring transition from the external description of what the character is doing, to the interior view of his thoughts. We don’t realize this has happened until we get through the first series of imperfect subjunctives (since hubiera and pudiera can be either first or third person) and hit mis amigos in the next-to-last line. Very interesting choice by the author, ¿no? This entry was posted in Uncategorized, Verbs and tagged Huracán, imperfect subjunctive, Sofía Segovia on 15 November, 2017 by jhochberg. Why can’t I wrap my brain around the verb “restar”? Regular readers of this blog know that I am constantly reading Spanish-language fiction — usually of the popular variety — both for pleasure and to continue improving my Spanish. I generally read without a dictionary, using context and cognates to deal with unfamiliar words, just as I advise my students to do. If I am really stuck, or just curious, or have seen a word a few times and want to “officially” learn it, I’ll look it up, usually in wordreference.com. It’s extremely rare that after using context, cognates, and a dictionary I still find it hard to understand how a word is used. The verb restar is one of those cases. Haberse movido así durante toda su vida o parte de ella no le restaba dificultad, a pesar de que él parecía hacerlo fácil. I easily understood the first part of the sentence (‘Having moved like this during all or part of his life’), and the last (‘even though he seemed to make it easy’ — or, more idiomatically, ‘even though he made it look easy’). The hard part was no le restaba dificultad. Restaba is obviously a form of the verb restar, and this is clearly a cognate of the French verb rester, which means ‘to remain’. But that meaning didn’t make any sense: ‘Having moved like this during all or part of his life didn’t remain him difficulty’????? My brain kept trying to rewrite the noun dificultad ‘difficulty’ as difícil ‘difficult’. The phrase le restaba difícil ‘remained difficult to him’ made sense in isolation, but didn’t work in this context. 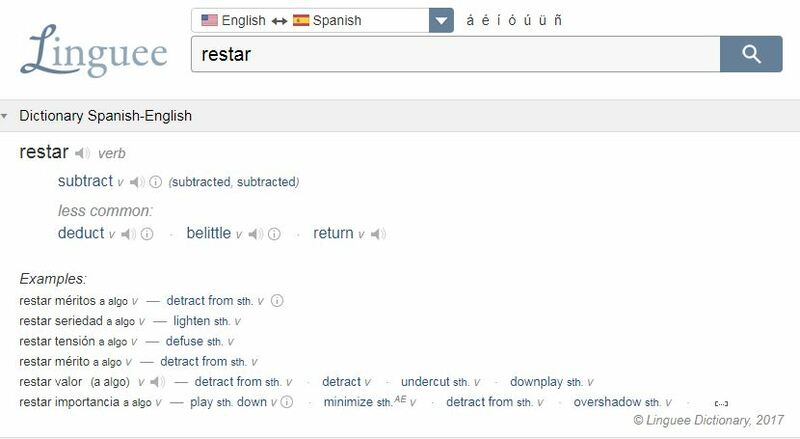 Restar clearly called for a dictionary lookup. Wordreference.com informed me that it means not just ‘remain’ but also ‘diminish’. The second meaning got the job done: the sentence meant ‘Having moved like this during his life didn’t diminish its difficulty, even though he made it look easy’. Toda la espalda menos — y eso a Lorna le pareció tan gracioso que le restó seriedad al problema — la marca blanca y nítida de dos manos, que contra la ampolla se veían hendidas. His whole back, except for — and this struck Lorna as so funny that it reduced the seriousness of the problem — was the sharp white shape of her two hands, which seemed to cut through the blister. It took some effort, and even a return visit to wordreference.com?, to understand this second example. Likewise, even though I now completely understand the restaba dificultad sentence, I still can’t read it smoothly, but always have to stop and think through its use of the verb. Restar is tricky since it combines two contrary meanings, ‘remain’ (which is positive) and ‘diminish’ (negative). The French verb rester, which only means ‘to remain’, is interfering with the second meaning of the Spanish verb. Abstract nouns like seriedad, dificultad are normally preceded by the definite article (el or la), but they aren’t in this context, which sounds odd. Finally, the sentence in which I first encountered the verb is a doozy. I still don’t completely understand it. If the man ‘makes it look easy’, or ‘makes it easy’, then why does someone watching him observe that the dificultad has not diminished? This entry was posted in Verbs, Vocabulary on 14 November, 2017 by jhochberg. This post has to do with linguistics, not Spanish, but please do give it a try. Thursday night I took a Greyhound bus from New York City to Atlantic City in order to lead a workshop at the annual NJEA Convention (gotta blog about that, too!). 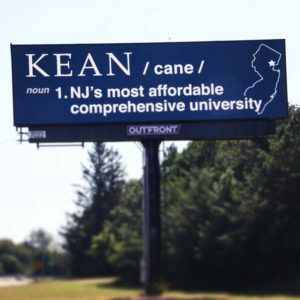 As we barreled down the Garden State Parkway I spotted a billboard for Kean University, a public university in Union Country, New Jersey. Formerly known as Newark State College, the university was renamed in 1973 in honor the illustrious Kean family, whose members have included New Jersey Governor Thomas Kean, Sr., the chair of the 9/11 Commission. The // slashes indicate a phonetic transcription (spelling), but as any Linguistics 101 student could tell you, the phonetic transcription of Kean (or Caine, cain, or cane) is /ken/. The transcription /cane/ represents a two-syllable word that has the vowels of latte, blase, or sashay but cannot be pronounced in English, since the phonetic symbol /c/ represents a sound not found in our language. Called a “voiceless palatal stop”, it is somewhere between a /t/ and a /k/. Kean was a major sponsor of the convention and had a large booth in its exhibit hall. Never one to pull a punch, I stopped by to complain about the billboard, and was told that the advertising campaign was meant to be humorous. Call me a goody-goody, but I don’t think that phonetic transcription is funny. To me it is an utterly serious tool for research in an important discipline. This entry was posted in Uncategorized and tagged IPA, Kain University on 12 November, 2017 by jhochberg. One advantage of living in our leafy but boring suburb is that I am only a short train ride away from the Instituto Cervantes in Manhattan. This has enabled me to easily attend events such as the U.S. inauguration of the Real Academia Española’s revised dictionary — the first major revision since the elimination of ch and ll — and a recent talk about Spanish in the United States. Last night the Instituto Cervantes hosted a major celebrity: Maria Dueñas, the author of the bestselling Spanish novels El tiempo entre costuras ‘The Time in Between’, Misión Olvido ‘The Heart Has its Reasons’, and La Templanza ‘The Vineyard’. The specific purpose of the event was to celebrate the U.S. publication of ‘The Vineyard’ in English. Sra. Dueñas also gave us a ‘heads-up’ about her fourth novel, now in progress, which concerns Spanish immigrants living in New York in the first part of the 20th century. I’ve read and enjoyed all three of Sra. Dueñas’s books (I previously blogged about El tiempo entre costuras here). Beyond this, I feel a connection with her because we have a lot in common. We are both middle-aged moms and academics (she was at the University of Murcia) who specialized in the linguistics of the other’s language (she studied and taught English applied linguistics) and who wrote a first book relatively late in life (she in her 40s, I in my 50s). The glaring difference, of course, is that her first book was an instant bestseller that has been translated into 35 languages and turned into a hit telenovela, whereas I’d be happy with continuing respectable sales of ¿Por qué? But still. Her first book’s origin story, as she described it at the event, was remarkable. El tiempo entre costuras takes place partly in Madrid and partly in Morocco during the Spanish protectorate there. Some of her family members had lived in Spanish Morocco, and she grew up hearing their stories. While enjoying a peaceful sabbatical in — of all places — Morgantown, West Virginia (a great place to live, according to friends) — she decided to write a novel set in that time and place. She had never written any fiction and had no connections in the publishing world. Nevertheless, after years of painstaking research and writing, she found a publisher who committed to a first imprint of 3500 copies, and within weeks the book took off via word of mouth. I don’t know whether Sra. 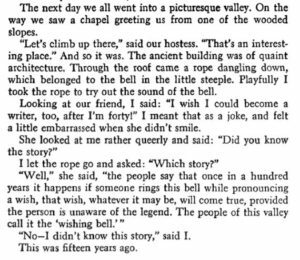 Dueñas ever pulled on a wishing bell — but sometimes, I guess, wishes do come true. This entry was posted in Spanish in the world and tagged El tiempo entre costuras, Instituto Cervantes, La Templanza, Maria Dueñas, Misión Olvido on 8 November, 2017 by jhochberg. When I was a girl studying Spanish as a second language, I learned to use the question ¿Qué tiempo hace? to ask about the weather. It translates literally as ‘What weather is it making?’ and was, in fact, one of the first examples I every came across that showed how different languages can express the same concept it fundamentally different ways. It comes with a list of related phrases such as Hace calor ‘It’s hot’, Hace sol ‘It’s sunny’ (literally ‘It makes heat/sun’), and so on, though some other weather expressions, such as Está nublado ‘It’s cloudy’ and Está a x grados ‘It’s X degrees’, use verbs other than hacer ‘to make’. These expressions went into my back pocket and I’ve been pulling them out for years, both when speaking Spanish myself and as a teacher. It was especially impressive that this difference actually caused misunderstandings, with speakers in some countries interpreting any question about tiempo to be time-related. So…am I old? Biased toward Spanish Spanish? Or out of touch? In any case, the next time I teach first-year Spanish I will be sure to use this topic as an opportunity to discuss dialectal differences. 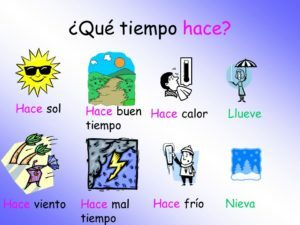 This entry was posted in Spanish in the world, Vocabulary and tagged Spanish dialects, Spanish weather terminology, Spanish weather terms, Spanish weather vocabulary, ¿Qué tiempo hace? on 3 November, 2017 by jhochberg.